Discussion in 'Iowa Whitetail Conference' started by Rous14, Feb 5, 2019. Hi guys, new to the site and first post. I’m finally going to breakdown and spend the money on a redneck fiberglass blind. I’ve bought the blind and now I’m trying to determine whether the 10’ tower is fine or if I should spend the extra $ for the 15’? I’ll bow and gun hunt out of it and I’ve got a small food plot that I’m planning to set it up on (1/2 ac approx). 10 foot is all you need. 4DABUCKS and Daver like this. Thanks chipterp. Kinda the way I was leaning too. 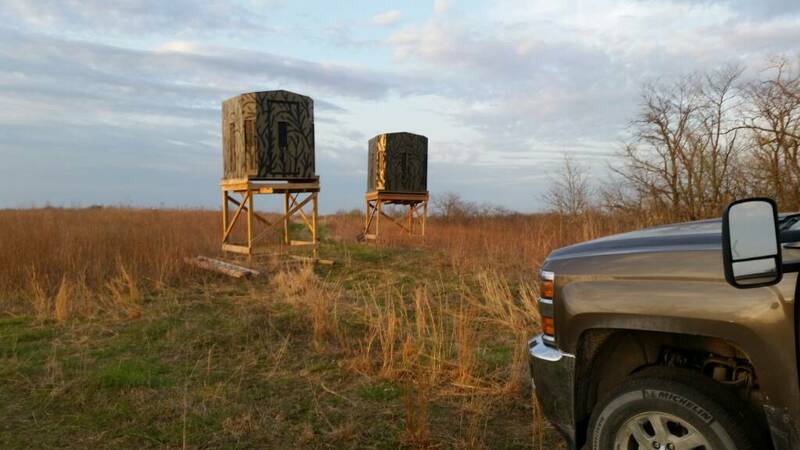 I’ve not done much hunting out of a box blind, I’ve always been 20’ up in a portable or ladder stand and so it’s hard for me to not think of 10’ as too low and I worry about getting away with movement. RoosterCogburn and chipterp like this. I have one at 12 and 1 at 10, though my next will only be 6' for ease of moving. Mine are on wooden, stick built platforms. My new 6' will have fork pockets build into it for moving with loader on tractor. Yep take out the vertical windows and paint them up to the same bottom height as your horizontal Windows. Thats a great idea, I'm gonna do that, do you do the outside or inside or both? We just did the inside. deep woods goat hunter likes this. The problem I found with anything higher than 10 ft is the shot angle out of the side windows. It really takes away quite a few shot opportunities. I since have switched to shadow hunter octagon with all archer windows. 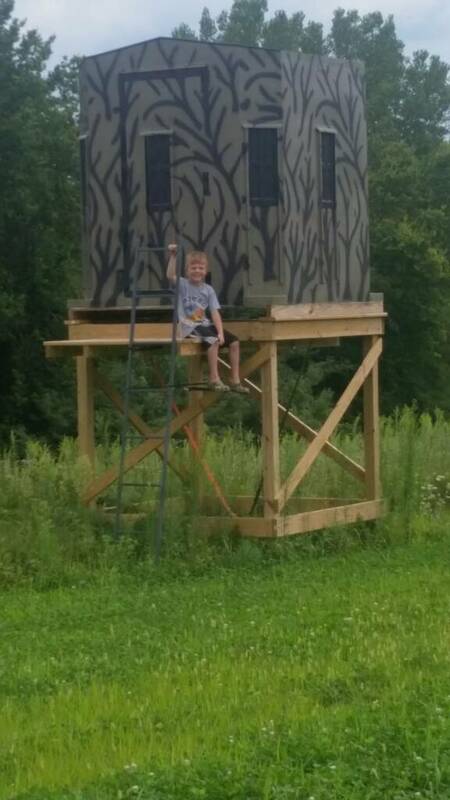 I build mine on wooden platforms at 6ft wit 4x4x12 skids on the bottom. The skids make them easy to move with just an atv. Here are a couple of pics how I do mine and then use an earth anchor underneath to strap them down. 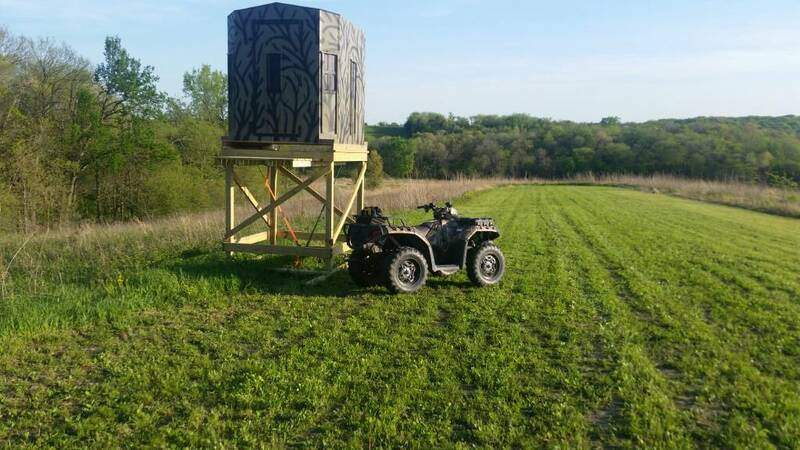 I was thinking about building one for bow hunting. I don't have much ground so the stands are basically on top of the plot. I'm pretty selective on what I shoot and at times there are "so many eyes" that I don't think I could pull my bow back without being spotted. What size windows would you guys recommend? Thanks. I would get something vertical 36-48” tall and 8-10”. Deerview windows or you can also buy tempered glass windows/hinges straight from redneck.